Molly and I rekindled our friendship following the death of a mutual friend. I am a chiropractor, and since we last saw one another, I became certified in animal chiropractic. Enter…Phoenix, the aging star of WildWorks. All of us age, including Mountain Lions. One of the best preservatives of youth is movement. Chiropractic helps joints to move more freely. It increases the range of motion of joints and decreases pain. Let me explain how Chiropractic works. Like a living telephone line, the spinal cord carries electrical messages from your brain to every muscle, bone, joint and organ of the body. The spinal cord is encased within the spine. There are 28 individual spinal segments from head to tail, joined together by more than 150 joints. When those joints do not work in perfect concert, they cause pain and interfere with those messages from the brain to the body. Chiropractic manipulation alleviates the pain and allows every muscle, bone, joint and organ of the body to work at its full potential. Phoenix has been getting chiropractic care to keep him moving. Needless to say, I was a bit apprehensive the first time, having never adjusted a mountain lion. Amazingly, he is a willing patient. He loves getting out of his enclosure and getting a walk. He seems to enjoy the adjustments. He even purrs while being adjusted. I think he feels he’s getting a great massage. He is still a wild animal, and I keep an eye on him. However, between his amazing personality and Molly’s training, he’s getting help that no wild mountain lion would ever get. I’m happy to be able to contribute to Wild Works, Phoenix, and Wow! 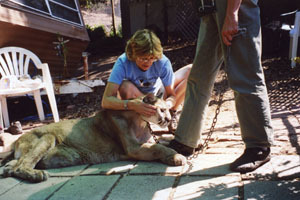 I adjust a mountain lion!